I love how my Cashew Curry makes me feel all warm on the inside and I always feel very mellow and full of love after I eat it. It's all those warm Indian spices! But my Cashew Curry is NOT spicy-hot, so don't worry. I use a great blend of MILD curry that even your kids will love! So let’s make some Cashew Curry! 1/2 cup whole cashews plus 1.5 cups water. Blend until smooth. If your blender cannot blend until smooth, soak your cashews in very hot water for 10 minutes, discard the soaking-water and then blend. 1. Lightly fry the chopped garlic in olive oil in a medium sized pot. 2. Blend the diced tomatoes until lightly chunky and add them to the fried garlic. 3. Make the cashew sauce in your blender. 4. Add the chickpeas, cashew sauce, curry and salt into the pot with the tomatoes. 5. Bring to a gentle boil. Reduce to simmer for about 20 minutes and enjoy! My Cashew Curry goes great with short grain brown rice or baked baby potatoes. 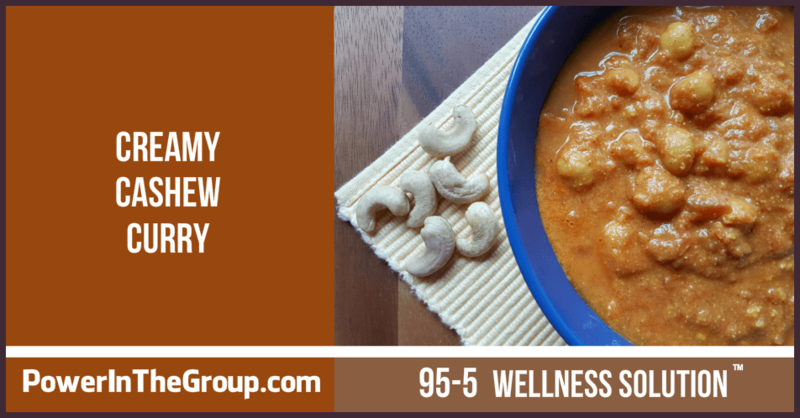 My Cashew Curry is a great sauce for lentil noodles, Zucchini zoodles or steamed cauliflower. What is Joan's Favorite Way to Eat Her Cashew Curry? Ok, I really like a certain kind of brown rice called Short Grain Brown Rice. It's very similar to sushi rice since it's a bit chewy and sticks together a wee bit. It's fiber is the same as regular brown rice but the shape is rounder. So, first things first, I need to make sure I've made my Short Grain Brown Rice! You can get Short Grain Brown Rice from Lundberg. I also steam 1/2 head of cauliflower (my hubs HATES cauliflower so my daughter and I split the cauliflower among ourselves...that means lots for me!!!). Then I take 1/2 cup of my short grain brown rice and spread that out on my plate, top that with loads of steamed cauliflower, and lastly top it all off with my Cashew Curry. Yum! Yum! Yum! 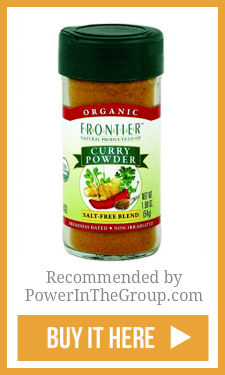 I've tried lots of curry powder blends and by far I think Frontier Naturals is the best tasting. You can see my Cashew Curry is packed with fiber! Just what the doctor ordered for better blood sugar control. And don’t freak out about the sugar that's listed on the label! 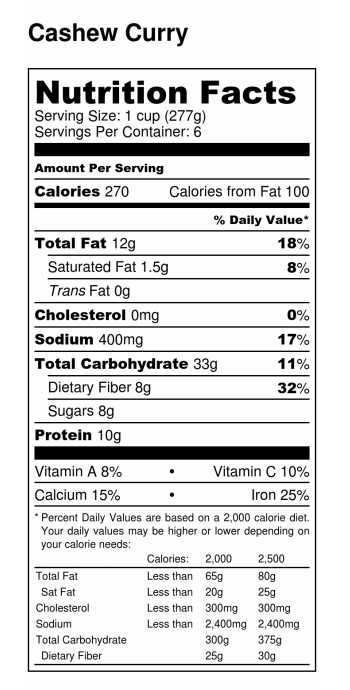 That's natural sugar (fructose) from the tomatoes and cashews (not added sugar). Natural sugar, like you see on this label, will have little to no affect on your blood sugar...UNLIKE refined sugar (table sugar, sucrose), which WILL raise your blood sugar VERY quickly. The reason your blood sugar is NOT affected by natural sugars is that your liver has to process natural fruit/plant sugar before it goes into your blood stream. This 'liver step' takes time, so any sugars from the plant are digested slowly, which is the opposite to the rapid speed at which you digest refined sugars. You only need to be concerned with ADDED sugar in recipes, NOT natural sugars from grains, beans, nuts or other plants. Thanks to my Cashew Curry Recipe Testers! A big shout out of thanks to my recipe testers for helping me with this recipe. You are right! It's better with more chickpeas! Want more Supper ideas? 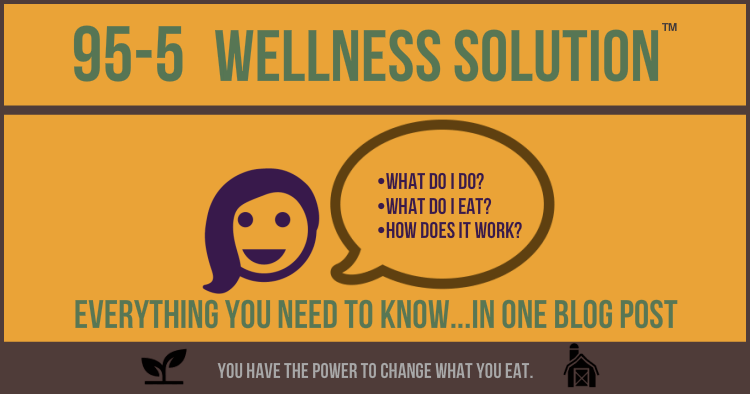 Download the 95-5 Wellness Solution! Lots of supper help, lunch help, breakfast help and more!